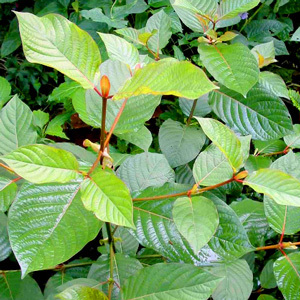 Kratom plants are actually fast-growing trees that produce large leaves even as seedlings. Kratom is an herb with an unusual history of being described as both a stimulant and depressant while at the same time possessing the chemical structure one might expect of a psychedelic. But, Kratom plants are an easy plant to grow (See this How to Grow Kratom article), and the rewards are many. ALLOW 1-3 WEEKS FOR DELIVERY! These Kratom Plants take a little time to prepare for shipping and are in high demand, so please allow time for delivery. They arrive in 4 inch temporary pots and each stands 4-6 inches tall, usually with multiple branches or "limbs" already grown or forming, they're already well rooted and growing quite vigorously. We take great pride in these Kratom live plants and guarantee that every one will arrive alive. PLEASE ORDER THESE SEPARATELY FROM ANY OTHER PRODUCTS CHOOSING *** USPS PRIORITY MAIL. IT WILL ENSURE TIMELY DELIVERY OF YOUR PLANT! ALSO: PLANTS DO NOT SHIP SAME DAY LIKE EVERYTHING ELSE, SO EXPRESS SHIPPING IS NOT AVAILABLE. PLEASE ALLOW 1-3 WEEKS FOR DELIVERY.